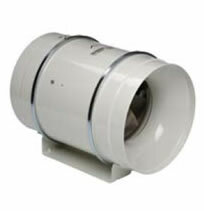 We stock Solar & Palau model TD Inline Mixed Flow Duct Fans! The S&P TD series of inline duct fans have been specially designed for maximum perfomance with minimum noise levels, within the smallest and most compact housing size. Sizes stocked in our warehouse range from 4" to 16" dia.